English: Iora, black-winged iora; French: Petit iora; German: Schwarzflügelaegithina; Spanish: Iora Común. 5.5-6 in (13-17 cm); 0.5 oz (13.5 g). Males have dark green to black upperparts, bright yellow underparts, black wings with white bars, dark tails, and black crowns. Females have olive-green upperparts, duller yellow underparts, foreheads, and eyebrows, and olive-green crowns. Almost all of Indian subcontinent, Sri Lanka, southern Yunnan and southwestern Guanxi, all of Myanmar, Indochina and the Malay Peninsula, Sumatra, Java, Borneo, and Palawan. Open woodlands, secondary forest, gardens, orchards, mangroves, and beach forests. Outside of breeding season, travels in small flocks or pairs, continuously hunting for small arthropods. Contact is maintained through frequent vocalizations. Distinctive melodious songs and whistles. Though some fruit is consumed, diet predominantly small arthropods (spiders, moths, caterpillars, etc.) gleaned from leaves. Monogamous. 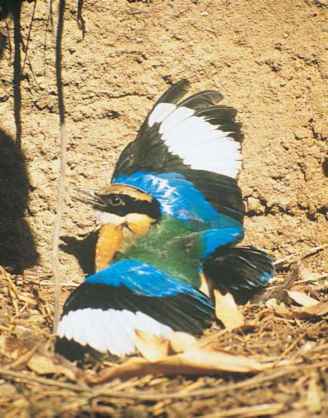 Distinctive courtship behavior: Male repeatedly leaps one or two meters above perch, then glides back down with feathers erected, assuming a spherical appearance. The nest is deep and cup-shaped. Clutch size two to four. Eggs are pinkish white with brownish or purplish blotches. Not threatened. Has likely expanded its range due to creation of orchards and gardens.